Iconographic changes to Arab-Byzantine coins during the 7th century A.D. reflect the rise of Islam and its spread throughout Byzantium and the Near East. 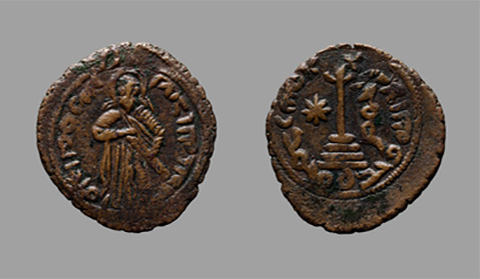 Arab-Byzantine coinage serves an important role in understanding the early years and development of Islam, the relationship between Byzantium and the Arab conquest, and how newly acquired lands populated by different peoples were administered under Islamic rule. Join Lester Stephens, Ph.D. candidate in the Departments of Classics and History, and the Robert and Jean Steele Graduate Curatorial Intern in the Department of Numismatics, for an introduction to Arab-Byzantine coins and the historical transformations that can be traced through this coinage. In this session, participants have the opportunity to handle ancient gold, silver, and bronze coins to appreciate their artistic qualities up close. Note: This Gallery Talk is a hands-on experience that is held in the Bela Lyon Pratt Study Room for Numismatics. All attendees are required to observe art handling and security procedures, including handwashing, checking bags, and emptying pockets. Participants are expected to remain in the Study Room for the duration of the talk. Space is strictly limited. Please meet in the Gallery lobby.